Rationale: The main (and jib) halyard should be made such that when the sail is fully raised, the supporting part of the halyard (between the shackle at the sail head and the point where it is fastened) is wire. When rigged this way, both main and jib halyards bypass the double block that came with the older-style Proctor masts about one and a half feet below the gooseneck. Instead, they come down the mast groove past the gooseneck and hook onto their rack, lever or magic box hook just below the gooseneck This saves wire and the aggravation of trying to pull a swaged loop past the sheave in the block. 1. Swage a loop lined with a thimble into one end of your new 3/32" halyard wire. 3. Now you can often just lay the wire part into the sail groove. If it does not go in easily, take a screw driver and gently wedge the two sides of the sail groove apart and let the wire fall in. 4. Put your mainhead shackle into its swaged loop and have a helper hold it in the 'main full up position', i.e. such that the shackle pin is about 1/2" below the lower edge of the black band. 5. Gently tension the wire and lightly 'kink' it around the middle hook of your halyard rack to mark the correct position of your loop. 6. Cut off excess wire, leaving enough to accommodate a 4" loop which you will now create by swaging. 7. If you use #4 Dacron braid line (cheap!!!) as a halyard tail, you can simply tie this onto the 4" loop with a bowline. #4 line runs nicely, even up the mainsail groove, and if its thinness makes you nervous, soak the part where rope meets wire with 5-minute epoxy glue to keep the #4 line from fraying too easily. You'll need less than 25' of this line. My apologies for not knowing more precise dimensions! 8. 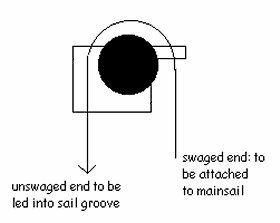 Now pull the swaged loop down near deck level and stow the main halyard as usual. Raise the mainsail until it is in perfect position (sail head at lower edge of upper black band). Mark the location of the lowest part of the wire loop attached to the tail. The middle hook of your rack should be at the level of this mark. The rack may be riveted onto the side of the mast groove (I prefer the port side) or you can make the system neater by removing about six inches of mast groove in the appropriate location and riveting straight onto the aft face of the mast. There is some question though as to how legal the latter is under the Class Rules nowadays. Once the rack is riveted onto the mast, check again to see which hook should be used so that your sail head is right at the black band. As long as you continue to use the same sail, shackle and halyard, your sail will now be in perfect position each time you hook the lower loop onto the appropriate hook.